WASHINGTON — Mick Mulvaney tried Wednesday to reassure Democrats on a House finance panel that he’s committed to punishing unscrupulous financial companies, while agreeing with Republicans that the watchdog agency he runs needs to be reined in and refocused. 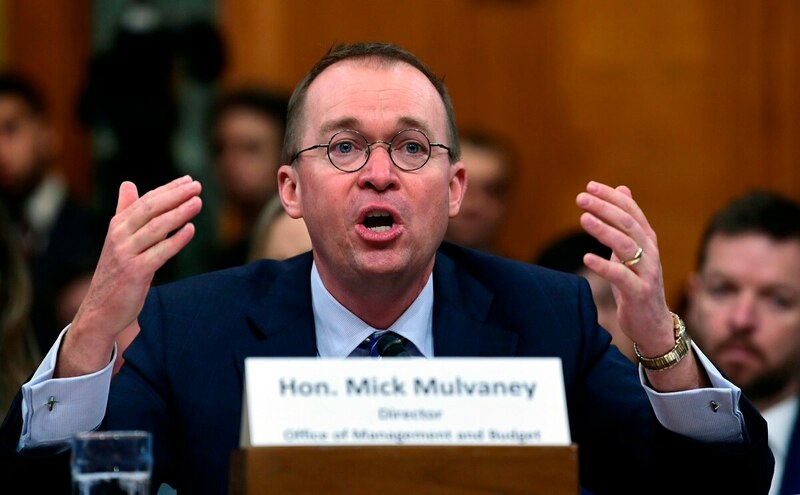 Mulvaney appeared before the House Financial Services Committee, his first appearance before Congress as acting director of Consumer Financial Protection Bureau since President Trump named him to that position in late November. He continues to hold his other job as Trump’s budget director. Democrats including Maxine Waters criticized that record Wednesday. They worry that the CFPB under Mulvaney is taking a business-friendly approach at the expense of consumers. Mulvaney said the bureau continues to do its job, with numerous investigations of financial companies in the works. “We are still enforcing the law,” Mulvaney said. “I have not burnt the place down,” repeating a phrase he has often used to combat his critics. Republicans praised Mulvaney’s performance at the CFPB so far. Mulvaney is the first Republican to lead the bureau since it was created under the Obama administration. Rep. Jeb Hensarling, chairman of the House Financial Services Committee, said that while he still feels the CFPB is an unaccountable, unconstitutional agency, Mulvaney’s actions since taking over have been a “welcome change.” Hensarling, R-Texas, is a longtime critic of the CFPB, and has sponsored several bills that would either abolish or severely restrict the bureau’s capabilities. Meanwhile, congressional Democrats refused to acknowledge that Mulvaney is the acting director of the bureau, referring to an ongoing court case in which the deputy director of the bureau, Leandra English, is suing, claiming that she is the true acting director. “I want to be very clear that Democrats’ participation in this hearing is not in any way an acknowledgment of Mr. Mulvaney’s legitimacy at the consumer bureau,” said Waters, the top ranking Democrat on the committee, in her prepared remarks. Mulvaney told the committee that the bureau still has 100 investigations ongoing and 25 court cases still pending against financial services companies, all cases or investigations that he would have the authority to dismiss unilaterally as acting director. The dynamic change in the roles of the questioners at the hearing represents a reversal from when the CFPB was led by Cordray. Democrats often saluted Cordray’s efforts to win financial relief for consumers while Republicans complained that he overstepped his mandate. In prepared testimony, Mulvaney repeated the longstanding criticism that the CFPB, created following the financial crisis, is too independent and its director too powerful. He outlined steps he said would make the bureau more accountable to Congress and the president. He has urged Congress to pass a law that would subject the CFPB to the traditional congressional budget process, instead getting its funds from the Federal Reserve. “I should not be able to walk down the street and get a check for $700 million, no questions asked,” he said. Trump has not announced a new permanent director for the bureau. Under the law, Mulvaney can remain in his acting role until June 22, at which point he must vacate the office. If Trump nominates someone before that date, however, Mulvaney can remain in his acting role until the Senate confirms Trump’s nominee. It is expected that Trump will eventually nominate someone, but Mulvaney will remain in this role until the end of the year. Mulvaney will testify in front of the Senate Banking Committee on Thursday, where he will face his most vocal critic in Congress: Sen. Elizabeth Warren, D-Massachusetts. The CFPB was the brainchild of Warren, and a number of bureau employees look up to her.